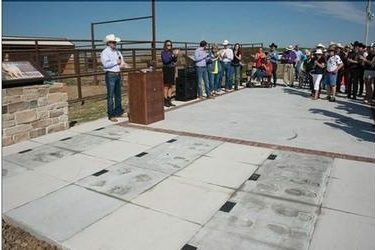 The Wild West Heritage Foundation unveiled the Wild West Walk of Fame today in a ceremony honoring the inductees to the Exhibit. The newest addition to the Buffalo and Longhorn Exhibit features eleven inductees that range from Hollywood stars to local icons. Visitors can see the hand and boot prints of these inductees featured around the Exhibit. “After completing our first project, we decided we needed a way to honor those people who have been dedicated to our common goal of preserving our wild west heritage,” said Ryan Deutsch, President of the Wild West Heritage Foundation.